Klear (assuming it is the same as Future/One Go) is ammonia based. So to losen a stuck llid you should just need to turn the jar upside down and drip some windex into the threads so it runs down between the jar and the lid. Works on paint jars (using thinners) so should work on Klear. What's Windex? I've never heard of it. That SERIOUS lid remover was quite pricey Chris, like £14, but worth every penny in my case. Windex® delivers the spotless clean for a streak-free clean you can count on. It's blue and comes in a trigger spray. Main ingredients are water, isopropyl alcohol and ammonia. IIRC Windolene was a UK equivalent (the clear blue one, not the purple cream stuff). Me too...….you are getting old when you can remember pink Windolene/old English spangles/petrol at less than a pound a GALLON! I can distinctly remember getting VERY worried about how we could afford to live when petrol went up above 5/- per gallon! That's FIVE shillings per gallon, or 25p per 4.54609 litres in today's numbers. And today's prices are nearly 7.5 times as expensive as it was back then in 1967. I use old white plastic pill bottles from OTC medicines. Glass/clear containers aren't ideal apparently because UV light will yellow Future (or so I have read). The mouth of a small aspirin bottle is wide enough to fit my usual wide flat Future brush. The lid gums up a bit but no real problems opening it, and if I ever do have a problem there are on a few ounces in it so I'm not that upset to just toss it and start another bottle. 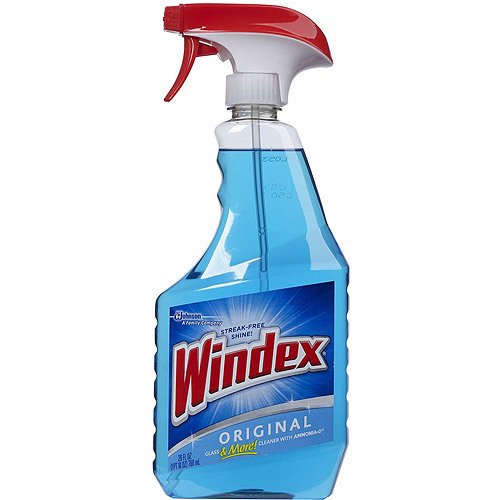 Another similar bottle has Windex in it for brush cleanup.